Industrial processes and jobs have been impacted by technologies such as artificial intelligence, big data, the internet of things, Nano-technology and automation for many years now, so Industry 4.0 is setting the standard for the next step. We now have smart machines being able to “communicate” with one another and adjust themselves to their working environments. The characteristics of smart machines has been raising concerns of them replacing people in industry, but this is what is required, as it is important in the UK regaining its competitiveness in the industrial world. People can be trained and redeployed in other areas of business to help growth as businesses become more competitive. The manufacturing sector in the UK has been facing many challenges in recent years and it is now battling to stave off a third recession in the space of ten years with the pound “crumbling” overseas, based on the latest CBI survey; however, this is always good for exports. Also, the UK construction industry has had its slowest growth in nine months based on reports in January. This slow growth is the consequence of the shortage of skills and cunctation in commercial property construction and housebuilding. Looking at a recent PwC report, we can see how British industry continues to have a freefall among its European rivals. From the report, it was noted that German industry plans to invest 3.3% of its gross revenue on Industry 4.0 for the next five years successively, where it is estimated that this will result in 12.5% growth. 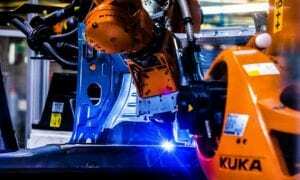 It is a known fact that the size of the German manufacturing industry is four times the size of the UK manufacturing industry, yet their investments in automation are seven times more than British investment in automation. To keep this in check, the next technological move by the UK must be given thorough attention. Some sectors have already benefited from Industry 4.0 initiatives such as Vauxhall Motors, which has invested heavily in 3D printing, helping them to not only increase productivity, but minimise the time in getting their product to market. For the manufacturing sector, using these technologies will make them more independent in their production, creating flexibility in business systems, localised manufacturing, better product customisation and shorter lead times. All these features will help the industry to compete globally and will provide their customers with more personalised or bespoke products. The construction sector is also starting to see higher rates of efficiency and safety from the use of technologies like automation and building information modelling. With the latter, the buildings are now being perceived as a digital asset and not just a physical asset. The building structures are studied, scrutinised and visualised, where this process improves the accuracy and design as well as highlighting structural hazards, which in turn assists designers in mapping out safety plans to be used by the construction workers. For both the manufacturing and construction sectors, there is business software in place to support automation that is helping organisations to make more effective and better decisions in many areas of their businesses, such as finance, supply chain and planning. To enjoy all these benefits, the UK industry will need to engage with their employees to ensure that they have the required skills. In both the construction and manufacturing sectors, business will have to engage more with schools, colleges and universities to ensure that the STEM (Science, Technology, Engineering and Mathematics) skills are focused on what will be required in the daily world of their students. Finally, as industry 4.0 becomes more prevalent in the UK manufacturing and construction sectors, the use of automation will change and elevate work. The UK must learn from the early adoption of this phenomenon from its European rivals who are becoming more industrially advanced. The UK must become technically focused to help the continued revival of these sometimes forgotten but extremely important sectors in the long run. ← Diesel engine – is it dying or not? Have your say! A well written article that should get people talking on how the UK can ‘up its game’ in the global manufacturing arena. Makay, we hope so, as UK plc needs to take this next important step.